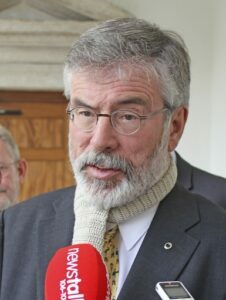 Gerry Adams, member of the Irish parliament for Louth and president of Sinn Féin, was arrested yesterday in connection with the investigation of the murder of Jean McConville in 1972. The exact procedural posture of the case is a little unclear to me: on the one hand, the news reports make it clear that Mr. Adams was arrested. On the other hand, the Guardian article, for example, suggests that he has not yet been charged. I am not confident that criminal procedure in Northern Ireland is similar enough to criminal procedure in the United States to give me any ability to understand where things stand. UK readers, please chime in! I think, though, we can draw at least one conclusion from the latest development. The PSNI is loaded for bear. I have to think that a decision to arrest Mr. Adams was made at a very high level, and I have to think that the PSNI wouldn’t have made the arrest unless it thinks it has some pretty good evidence. Time will tell. Apparently arrested and charged are not interchangeable terms in the UK. Arrested means they can question and hold you up to 48 hours (longer if a judge approves). Theoretically they have to charge or release you within that time but there are many instances of political internment in the north of Ireland. That is my understanding anyway but, like you, I am an American and it is a difficult concept to approach from that perspective. 1. In the US, when you are arrested, either the police had a warrant for your arrest, in which case charges had already been presented either to a judge or a grand jury, or else the police have to file a complaint promptly after your arrest. I assume that something like this must be so in the UK as well—after an arrest, you should have to be promptly charged if you haven’t been charged already. But from the press accounts I’ve been reading, it’s not clear to me that that’s so. 2. Mr. Adams has made a point of saying that he went to the police station voluntarily. But precisely what makes an arrest an arrest is that you’re not free to leave! Perhaps Mr. Adams is just an old-fashioned stoic. Perhaps he is making a virtue of necessity. The PACE Codes of Practice state that if police want to question someone about their alleged involvement in an offence then, in the absence of urgent justifying circumstances, they must do so under caution and at a police station. If the person in question attends voluntarily then that suffices (although it will necessary to arrest them to prevent them leaving), but if not the person will be arrested and brought to the station. The powers of UK police to arrest without warrant are broad and routinely exercised. The Northern Irish law on admissibility of hearsay evidence other than confessions is to be found in Part III of the Criminal Justice (Evidence) Northern Ireland Order 2004, and attention is drawn to article 20 (cases where a witness is not available, which Belfast Project interviewees may well not be). Assuming that “Z” is in fact Ivor Bell, I wonder: assuming (as I do, but in light of what you’ve just explained maybe I shouldn’t!) that Bell has a right against self-incrimination that he could invoke to avoid testifying in any trial of Adams, would his out-of-court statement come within the “fear” prong of article 20? In the circumstances Bell would be a competent and compellable witness for the prosecution against Adams (see article 31 of the Criminal Evidence (Northern Ireland) Order 1999), and would have no right to refuse to answer questions. There is however a rule of practice (but not of law!) that the prosecution should not in these circumstances be calling Bell as a witness, even if he were willing to testify, unless they have undertaken to discontinue the proceedings against Bell. It is difficult to see how introduction of hearsay statements could be permitted as an alternative in circumstances where an available and willing witness is not supposed to be called. If Bell, having been summoned, did refuse to give evidence out of fear for some cause acceptable to the court then it is still necessary for the court to give leave for the introduction of the tapes and the court must consider the factors set out in article 20(4). Also the overall fairness of the proceedings must be borne in mind, and otherwise admissible evidence can be excluded by various routes if its admission would make the proceedings unfair. R v Horncastle  EWCA Crim 964 discusses at length the interplay between the identical English statutory rules on hearsay and the ECHR article 6 right to a fair trial in light of the decision of European Court of Human Rights in Al-Khawaja v United Kingdom ((BAILII)) that there had been a breach of article 6 where convictions “had been based to a sole or decisive degree on the statements [by identified unavailable witnesses] which the appellants had had no opportunity of challenging”. All of this assumes that “Z” can be identified to the court’s satisfaction, whether or not he proves to be Bell; if not the requirement of article 20(1)(b) is not satisfied and the tapes are not admissible under article 20. I’d like to add to the discussion one key thought: The arrest of Gerry Adams at this particular point in time is likely a political maneuver. Northern Ireland is in the middle of an election campaign, and Adams volunteered to come in to discuss the McConville case awhile ago, before the elections. Whatever evidence the PSNI has or doesn’t have, it’s difficult to see how the timing isn’t intended to derail Sinn Fein in the upcoming polls. In addition, I wouldn’t be surprised if the Fine Gael-Labour coalition in the Republic had encouraged it as well, since the “Shinners” are increasingly popular there. Hi there, not sure if this is relevant but Adams according to this evenings news is held under the terrorism act, he is due to be released around 8 this evening if not he can be held until 8 tomorrow night but after that the police will have to go to court where he canbe held potentially for up to 28 days. Most commentators think this is unlikely, and say he could be released without charge, or a file sent to the DPP (director of public prosecutions for his decision) or charged. We should know for certain how the land lies in this issue in the next 24 hours. Also Bridget and Ted, the news said that this was an ‘interview under caution’ and Gerry Adams showed up with his solicitor, which would suggest he knew the possibility of being detained, this would be bourne out in my view with the interviews given to RTE where Mr Adams restated his position, before he went to Antrim. Whether or not you believe this to be a political policing act there is certainly a huge PR fight back going on and the FT have done a good job of analysis on this aspect of things. Police going to court now to request extension in holding Adams. Presumably they will have to show their hand to a certain extent, may shed some light on where they are going with this. The plot reveals itself as the farce it was always destined to be.